Bobby Clennell has been a direct student of B.K.S. 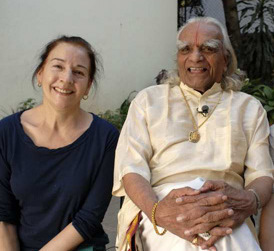 Iyengar, Geetha Iyengar and Prashant Iyengar for over 35 years. She is a core faculty member of the Iyengar Yoga Institute New York. In her teaching style, Bobby combines discipline and precision with warmth, humor, compassion and encouragement. She is the author and illustrator of ‘The Woman’s Yoga Book’. Her new children’s book,’ Watch Me Do Yoga’ was published in September 2010. A comprehensive program of asanas tailored specifically for women. Helps to develop a cyclically responsive practice where we avoid injury and fatigue & promote vibrant good health, boost fertility and help lead women to a smooth transition through a trouble-free menopause. Learn the basic principles of alignment through a sequence of standing and other poses. Adding in flexibility principles to explore the relationship between hamstring and quadricep muscles with the pelvis, spine and heart. Learn to navigate through the menopausal transition with a practice that calms the nerves and brings hormonal balance. Heal through hip openers and supported poses that address problems such as hot flashes, insomnia, fatigue and anxiety, stiffness, osteoporosis, joint pains, weakness and loss of muscle tone. Explore solutions to common menstrual difficulties and issues surrounding fertility. Learn how to synchronize our practice with the hormonal ups and downs. A sequence of back bends (supported and unsupported) and other poses that promote lymphatic drainage, strengthen the immune system, support the liver function opens up the chest, upper back, shoulders and support breast health. Inversions widen our spiritual horizons and help cultivate insight and mental clarity. Also develops strength, particularly in the neck, spine and arms. Practice a mentally calming sequence to generate the energy you need for life. Be introduced to poses that address issues such as physical and mental exhaustion, fatigue, emotional depletion, stress and depression. Learn the fundamentals of a safe and secure pranayama practice. A sequence of asanas and pranayama practice to help soothe nerves, alleviate tiredness and to strengthen the pelvic floor muscles. Learn safe and supportive poses to prepare the expectant mother for labor and delivery. Kindly contact Anita 012-2095464/ Edison 012-5765091/ Zoe 012-3060211 for further information or send your enquiry to zeayoga@gmail.com.